The sun has finally returned, and now’s the perfect time to get back to nature. Take a look at these walking trails and beach spots surrounding Two Rocks, and you might just find that this is the perfect place. A short 15 minute drive from Two Rocks is Yanchep National Park. Some may think of this park as a spot to have a picnic or an afternoon jog – it’s actually quite a bit more. With a total of nine trails ranging from 500m to 52km, Yanchep National Park is a jumping-off point for whatever sort of bush walk you want to have. Here are a few of our favourite walks. 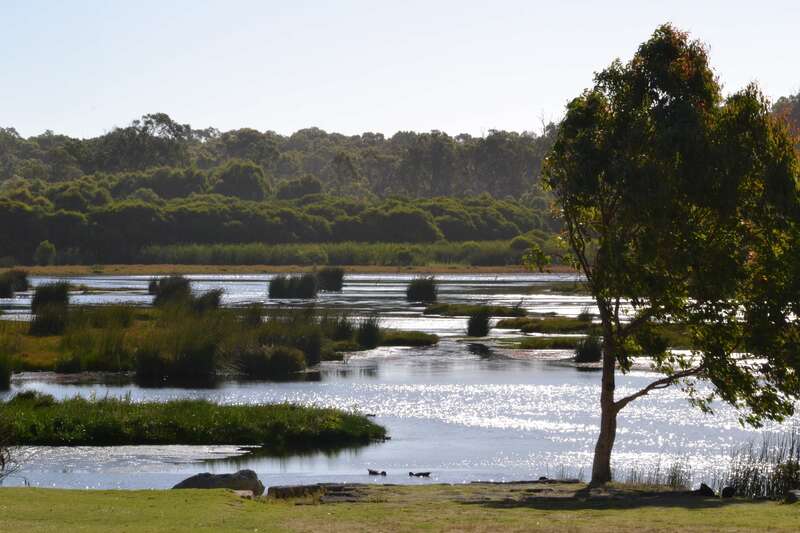 Dive into the lush forest, venture through the wetlands, and enjoy pristine lake views that can all be packed into a few hours on the three short trails stemming from Yanchep National Park. Wetlands Walk Trail, Woodlands Walk Trail, and Dwerta Mia Walk Trail offer all of the above. And at around 2km each, they can be enjoyed by just about anyone. You won’t need to read a detailed trip report before embarking on these – so here is a good overview of what’s available. Wander through coastal plain vegetation, explore historic bunkers and even get a peek at the coastline on certain spots along this 14km loop. Go now (in spring time) to enjoy WA’s famous wildflowers at their best. Bonus: The trail summary from Trails WA says a Kangaroo sighting is almost certain if you go in the morning or evening! Named for the historic remains of the ‘Ghost House’ pictured above, this hike is worth it just for the scenery you’ll catch sight of along the way. Beautiful wetlands, lush vegetation, hidden woodland nooks perfect for a cup of tea, and fetching granite outcroppings amidst the lush forestry make this trail a winner long before you hit the Ghost House. Ghost House Walk Trail starts on the opposite side of the lake from the parking lot, so you’ve got to take the Wetlands Walk Trail around the lake before you find the trailhead. This ‘Bush Walk’ is about an hour and forty-five minutes north of Two Rocks, but it’s a cracking bush walk, so we had to throw it in. Massive stone pillars. A desert landscape that feels like the end of the world. And millions of years of dramatic geology visible at a glance. A visit to the Pinnacles is an absolute bucket list experience. A note: there are two ways to explore the Pinnacles – by car on a driving path, or by foot on a path that takes you further out. If you have been to the Pinnacles but haven’t gotten out of the car and done the walking trail, you’ve missed out! In our opinion, the best thing about Nambung National Park (home of the Pinnacles) is the Desert View Walk Trail. After making the scenic drive North on Indian Ocean Drive from Two Rocks to the Pinnacles, you’ll arrive at a well-maintained parking lot and visitors’ centre. Access the walking trail by taking the main entrance to the visitors’ centre and walking through that building. Check out the museum and gift shop on your way through if you like! Once through, you’ll immediately start seeing wooden posts that mark the footpath route. Following one sign to the next will keep you on the footpath. Some parts of the walk are pretty open-ended, so to keep from losing your way, make sure you spot the next sign before leaving the one you’ve just found. They can be a bit tricky to spot, but they are always visible! Once you get the hang of it, this walk is absolutely magical. It takes you away from the touristy feel of the driving path, and out into the fringes of the true desert in some spots. The total length of this walk is about 2km, but you may well spend hours admiring the scenery and wandering around a bit. Overall, this experience is well worth the drive! Fancy a day on the beach instead of a hike? Yanchep Lagoon Beach has you covered. Picturesque, uncrowded and protected from the waves by a rocky sand bar, this is the perfect spot for an afternoon vacation. Whether you like swimming, fishing or surfing, this natural lagoon just 8 minutes South of Two Rocks is the place to be. Speaking of surfing and fishing – Two Rocks is a great place to do either one! Look no further than Two Rocks Marina, and the coast right near our village for world-renowned fishing and waves. Spring has sprung and time is fleeting – get outside and enjoy the outdoors near Two Rocks! We hope you’re feeling inspired enough to take action. This natural beauty should be enjoyed by all.